Howlin' Wolf Records: SIX STRINGS: Intrada Hits Hard as the Year Comes to an End!!! A mystery is solved! Intrada premieres two scores for same 20th Century Fox film, yet neither is in finished picture! Jerry Goldsmith fans know when composer is unavailable to score movie, final soundtrack from Andrew V. McLaglen western becomes compilation of selected tracks from earlier Fox/Goldsmith pictures including 100 RIFLES, RIO CONCHOS, MORITURI, STAGECOACH. But few fans know Lionel Newman actually re-recorded same selections at Fox with intention of using all-new recordings timed specifically for picture. Ironically, due to time pressure, famed music editor Len Engel and young Ken Hall instead end up cutting music for picture with actual original recordings, planned initially just as temporary placeholders while Newman newly-records same sequences. 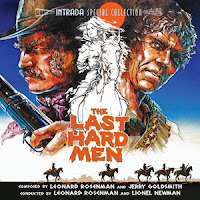 Even fewer fans know Leonard Rosenman actually writes complete score for film, long before Goldsmith music becomes involved! At last! 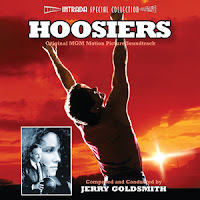 Long-awaited world premiere complete presentation of endearingly popular Academy Award-nominated score by Jerry Goldsmith to endearingly popular sports drama starring Gene Hackman, directed by David Anspaugh, written by Angelo Pizzo. Goldsmith score originates on wonderful LP with duration of 39 minutes but never appears on CD in U.S. International releases (some under U.K. title Best Shot) all have same contents as original LP. Goldsmith emphasizes rousing basketball music but, interestingly, omits several more serious ideas from his album, including one important theme represented only in this new complete version. Titled "No More Basketball", saddened cue offers haunting tune for woodwinds, strings and actually appears twice in finished film. World premiere release of two Hugo Friedhofer scores to Paramount films directed by Mitchell Leisen. 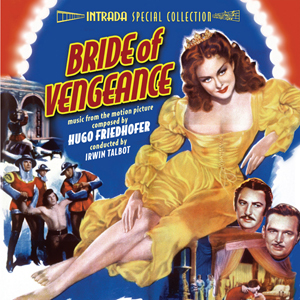 First is 1949 costume adventure about 15th-Century Borgia family, starring Paulette Goddard. Friedhofer took opportunity to write serious Renaissance-style score using several established "closed forms" including the passacaglia plus offering regal fanfares, courtly music, battle sequences, more. Score is rousing, profuse with period color. Second score is 1950 WWII espionage thriller with Alan Ladd.